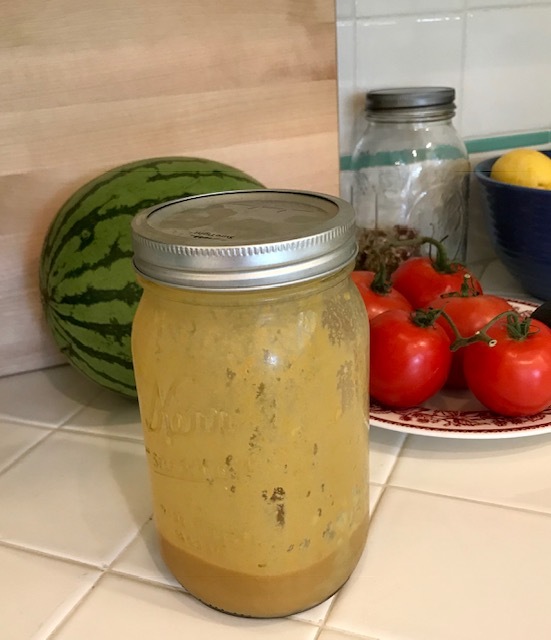 Because I Love You, I Give You, Hollyhock Salad Dressing - . When I was in Canada a few weeks back, at Hollyhock Center on Cortes Island, there was gorgeous scenery. One of the most gorgeous scenes of all was the salad dressing on the table at lunch and dinner. They have a phenomenal garden at Hollyhock and the simple garden greens dressed with this stuff were amazing. I think I've posted maybe one other recipe on Smacksy in the past billion years. That's how important this salad dressing is, you guys. There's barely any left, of course. This recipe is from their cookbook, Hollyhock Cooks. Place cider vinegar, tamari, garlic and nutritional yeast in a blender and combine. With blender running, pour in oil to reach desired consistency. Lasts for 2 weeks if refrigerated. Sounds right up my alley. Thanks, Lisa!